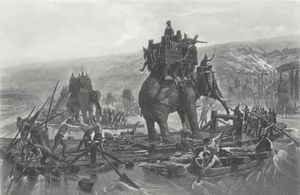 War elephants were a form of cavalry used by the Carthiginians, especially in the Second Punic War under Hannibal, and by various Indian empires. Alexander the Great faced 100 war elephants earlier in 326 B.C. when he was crossing the Hydaspes river in India. His military genius improvised how to handle them and sent many of the maddened creatures rushing back through the defenders' lines. Several of Alexander's successors also employed war elephants, usually imported from India. In recent years they have been used in several fantasy movies, including 300 and the film adaptation of The Lord of the Rings. ↑ Dupuy & Dupuy, The Encyclopedia of Military History, 1977, Pg. 51-52. This page was last modified on 13 July 2016, at 16:33.